An audio recording of the Presiding Bishop’s sermon is now available on the cathedral website, along with the text. Also, in the afternoon, the Dean of Southwark made comments about the morning event in his sermon, text here. This morning there is some comment about the event in the Diary column of the Guardian. Read that over here. ENS reports from the TEC Executive Council meeting now proceeding in Maryland, that Lambeth Palace tells presiding bishop not to wear symbol of office. “This is apparently a requirement of one of their canons about the ministry of clergy from overseas,” she said. A commenter on another thread has linked to a picture showing the Presiding Bishop carrying her mitre. The full text of the Overseas and Other Clergy (Ministry and Ordination) Measure 1967 can be found here, and further context can be found at this TA article from February 2005 (scroll down to Question 56 and follow the links). 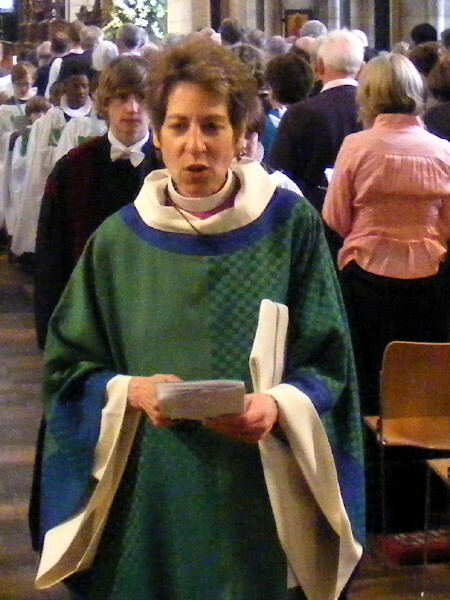 Presiding Bishop Frank Griswold wore a mitre at Southwark Cathedral in 2006, see Griswold wore mitre at Southwark. Presiding Bishop Katharine Jefferts Schori wore a mitre when she preached at Salisbury Cathedral in 2008, see Salisbury diocese welcomes Presiding Bishop, Sudanese bishops for pre-Lambeth hospitality initiative. See this picture. Ruth Gledhill has written about this on her blog, see Bishop crossed in mitre row. Another picture there too. The story in The Times is headlined Female US bishop forced to carry mitre in ‘snub’ by Lambeth Palace, but that is behind a paywall. That being the case I either would not have showed up or would have preached in street clothes. That indignity suggests not that she is a woman but that she is an invalidly consecrated bishop. Did ++Rowan really mean that? If so we in TEC might as well leave. There are times when it seems that TEC could have no better friend than the present Archbishop of Canterbury. His political astuteness is quite remarkable. The Dean’s unspoken implication is that the Archbishop of Canterbury did act “without courtesy” — towards another. Not quite a full blown ecological disaster in this case but it further strains relations. What a wonderful legacy Rowan Willams is creating for himself in the history books. That last sentence takes on much more meaning in light of the restrictions the ABC placed upon her visit. I will take her over anyone in the “hair on fire” crowd any day. In fairness to +Rowan, and without knowing the facts: here in Ireland it is customary for the bishop to only carry his staff in his diocese – so for us a visiting bishop would not do so, and no disrespect intended. But it’s very hard to be a generous gracious host while getting knotted in red – or purple – tape. She is in the best company – Bishop Gene Robinson was also refused the mitre, as have all women bishops who “formally” ask. The pastoral staff rarely appeared outside the prelates own particular jurisdiction, or have things changed lately? I thought it charming when I read Simon reporting that she carried her mitre – a lovely touch – other women priests at the celebration must have keenly felt the anticipation as she bore it in procession – almost as an offering! I remember Mother Pattie who processed with her mitre and crozier carried before her – very swish!! I’m sorry if I hurt any feelings, but Archbishop Williams’ tacky behavior is rendering him irrelevant. Most of us in the states consider his words and actions as trustworthy as Tony Hayward’s or Pope Ratzinger’s word and actions. He has forfeited his integrity. I must say I don’t know where this notion of the mitre signifying “orders” and the crozier “jurisdiction” came from, but it seems to be one of those liturgical urban myths like laying aside the maniple to preach or 39 cassock buttons for the Articles. Neither mitre nor ‘crozier’ are mention in the BCP (1662). They are modern innovations in the life of the C of E -especially the mitre. Even today, not all bishops use one, in UK. Please, stop the anti Rowan rhetoric. I’ve seen a handful of foreign bishops (including the Primate of Brazil) at Southwark Cathedral and none of them have had mitre or crozier. It’s not a snub, it’s English canon law. As an American in London, the anguished cries of the Americans on this blog are absurd. remember Mother Pattie who processed with her mitre … carried before her – very swish!! Well said. Needs saying again and again. Especially as its fruits are so dire (as we read in this thread, and thread after thread). I dunno – abbots and abbesses use croziers, and I thought that that was because of their “jurisdiction” over their monastic community. Historical note: The Primatial Cross of TEC was given to Presiding Bishop Arthur Lichtenberger by the Bishop of South Florida, Henry Louttit, Sr., on the occasion of the consecration of two suffragans for that diocese [in the early 1960’s]. I witnessed the occasion as a seminarian from that diocese. At the time there were those who considered it an ultra high church innovation. On the heels of Henry Knox Sherrill’s presiding bishopric, it was a big deal – coupled with the PB wearing gold cope and mitre. It has been used by our PBs ever since. Does the Archbishop of Canterbury carry his Metropolitical Cross in the United States? If we are stuck on the minutiae of episcopal insignia, I suppose the pectoral cross and ring would have been forbidden the Presiding Bishop too? In every province, should they choose it. It arises out of the question of jurisdiction which is not an unimportant one, otherwise we would not all be so exercised about cross-border incursions, would we? I think perhaps it is time to accept that the Archbishop, by his actions, has broken communion with the Episcopal Church and move on. Oh, well, then – away with the marks of Popery! Back to the north end of the altar! No, their general disuse was the innovation. The CofE used them since early days until after the Reformation. And, I’ve read, their use did not completely die out even then. They were worn by the bishops at the coronatios of Henry VIII, Edward VI, and Elizabeth I – and may have been worn at that of Charles I. Actually, what I should have said is that *of course* the mitre is authorized by the BCP 1662 – in the Ornaments Rubric. What did our previous primate wear in Southwark Cathedral when he presided 2006? Are there any photos of the procession out in Anglican Land? What tickled me , was the letter from the dissenting ” conservative ” Southwark clergy who cannot agree what the Bible has to say on the meaning of being born again, saved, the eucharist etc. Francis Gardom should inspect what the other clergy do with the communion elements after their services! They claim they are Biblically orthodox and Bishop Schori is not! They make the rules for other people and bend them their own.